Mucho Mundo Chocolate is the first museum in Mexico dedicated to enhancing the experience of chocolate – as if chocolate needed any help. But beyond the purely hedonistic aspects of consumption, the museum puts chocolate in a historical context, tracing its origins back to the Mayans, who first fermented the seeds inside cacao pods and used them to create a hot bitter drink we’ve come to know as chocolate. The favored drink of kings and priests, it was considered food fit for the gods. When the Aztecs gained control over the Maya, cacao seeds were elevated to the level of currency, making drinking chocolate a luxury few people could afford. The arrival of Spanish conquistadors brought chocolate to a wider European audience, yet is still remained a product almost exclusively consumed by the wealthy until industrialization brought about the arrival of solid, mass-produced chocolates. Today we take the ubiquity of chocolate for granted, but a demonstration in Mucho’s test kitchen made clear to me how labor intensive making chocolate the Mexican way once was: first you heat the metate, a traditional grinding stone, while shelling as many roasted cacao pods as you need. (Hint: more than you think. 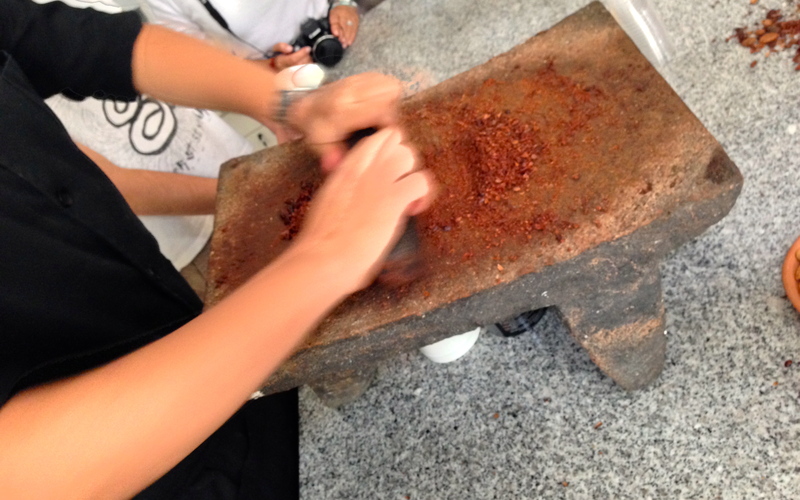 Roasted cacao seeds are as addictive as cocktail peanuts.) Then grind them on the metate by flicking your wrists with a mano, an elongated pestle. Add a handful of raw almonds to the mixture – their natural oils will slowly release and bind the cacao together – and a sprinkle of cinnamon and sugar. After a bit of sweat you’ll have a crumbly paste, which can be added to water to make drinking chocolate, or serve as the base for baked goods and, after further processing and tempering, chocolate bars. I scooped up a bag of the crumble and munched on it as is; savory, slightly sweet and spicy, it was a tart reminder of why I hate milk chocolate: the fat in dairy dilutes the pleasing bitterness of the cacao. Which, I guess, is why the world is divided between devotees of milk and dark chocolate. On some things we must agree to disagree, however; after experiencing the effort involved, I won’t pop a truffle into my mouth with casual disregard again.